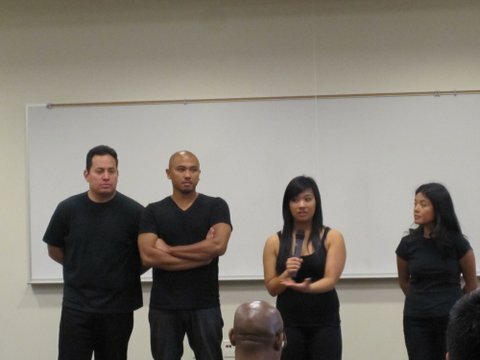 On April 17th, APIA sponsored the Asian theater group, hereandnow, with funding from the Fullerton College Foundation. hereandnow was started by John Miyasaki with young actors frustrated over the lack of non-stereotypical roles in film, television, and theater. With over 200 actors as cast members over the years, hereandnow has evolved and diversified to include Hispanic actors. The theater group strives to reflect the experiences and to tell the stories of their cast members through vignettes. They perform around the country at colleges, universities, conferences, and festivals. hereandnow cast members performed in front of approximately 60 students, faculty, and staff. About half the students turned in surveys about the event. Many found the vignettes thought-provoking as well as entertaining. A number of students could relate and understand the stories being told. Some students commented that there aren't enough events reflecting the Asian/Pacific Islander experience. We'll have to keep trying to organized these events!